Kasey Brennan, communications genius and word ninja behind KB Communications knows the importance of connecting with your potential clients. Kasey writes, "KB Communications was born out of a deep desire to help organizations effectively share their stories with the audiences they impact. Whether you're a national corporation looking to showcase your expertise in the trade media, or a local nonprofit hoping to increase awareness in your community – I can help." As Kasey helps to connect potential clients to organizations through words I help connect potential clients to businesses through styling. Business owners are no longer after a regular old headshot to place on the bio page of their websites, they are looking to share more about who they are and the why behind their business in order to better connect with their clients. Imagery can be just as important as words. I loved working with Kasey, not just because she's a sweet person but because she truly got the purpose of her branding images. Kasey moved into her home not too long ago while she searches for a more permanent place with her new husband. She has been stumped on decorating her office. Although I thought it was pretty cute, it didn't truly represent her brand. She shared some inspiration on Pinterest along with her new site and I got a good idea of her brand through all of that. From there I began sourcing and curating the perfect details that would showcase her brand and style and really shine in her brand images. I will do a little before and after for you. The before images were taken on an iPhone but all other images were taken by Laura Foote. I wanted something to draw the eye up and add interest to the wall. I chose a piece with a natural element and texture because it fits Kasey's brand and style. I bought a classic framed cork board for Kasey's pieces of paper that inspire her. She had a lot of papers that where important or meant something to here and this just provided a space to house all of that and add some decor to the mall. To add in more natural elements I found a wooden letter holder and papers in her branding colors to place in it. Kasey loves chambray (me too!) and I found the perfect chambray notebooks that tie in her style to her desk. I found Kasey some glass geometric pen holders to bring in some modern elements. I bought some pens and pencils in her branding colors to create a cohesive story. 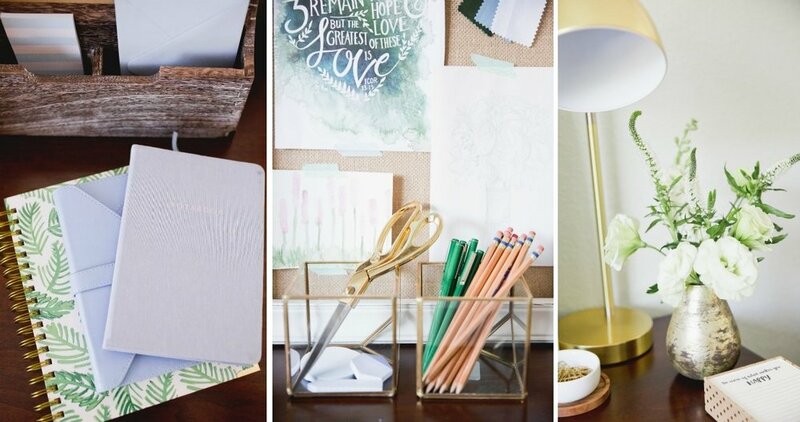 Kasey shared a gold task lamp in a lot of her inspiration photos and I love how it looks on her desk. I created a floral arrangement that is free flowing and organic to bring some more natural elements to her desk. Speaking of desk. Kasey's desk is an heirloom passed down from her grandfather. It is where he worked to run his own business and I just love that Kasey runs her empire from it too! I absolutely love the way Kasey incorporated these images into her new site, you should definitely go take a look here! I also have to say Laura Foote is amazing to work with. She knows and understands the importance of brand imagery too. She takes the time to get to know each of her clients to understand their brand and in doing so will know which specific shots to take to use for your marketing efforts. I highly recommend Laura! Kasey, you are a joy and I loved working with you. I wish you all the success in your business! Thank you for trusting me to help communicate your brand through styling these images.